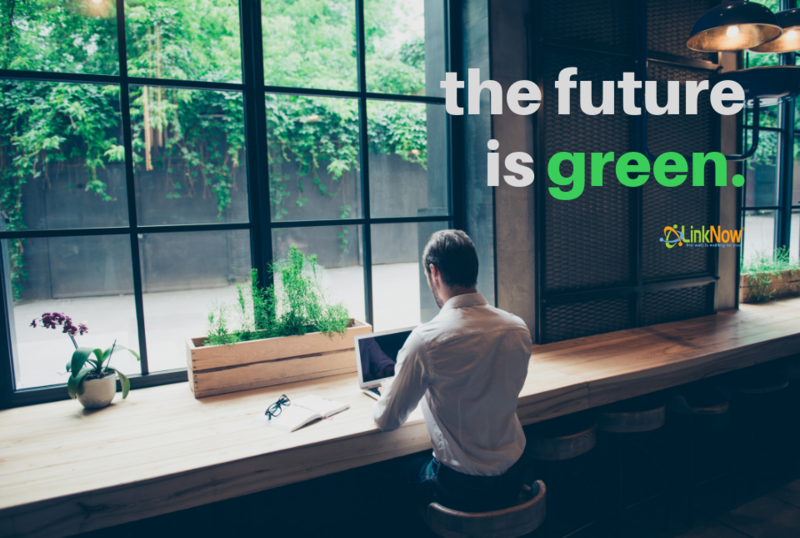 7 Ways to Go Green at the Office ‹ LinkNow Media | We're Hiring! It’s 2019 and—even if you’re in denial about the apocalyptic predictions on climate—everyone knows that the environment is worth saving. You’ve taken steps at home. But how about in the workplace? Whether that means upgrading to more energy-efficient solutions, switching to more eco-friendly products, or installing dimmers and timers, we think going green should be a top priority! In this spirit, we’ve assembled the following list of small but impactful steps that offices can take in reducing their environmental footprint. The result will be a cleaner, more efficient, and more sustainable workplace. We live in the age of the internet. The age of smart phones and instant communication. Not to mention permanent digital records of our every action, thought, and desire. And yet, we’re cutting down more trees than we can grow, for the paper we don’t even need! So why not just go digital? All those training documents for new employees? Email them. All those contracts, agreements and consent forms? Digital signatures. All those office communications and memos—should’ve dealt with them 20 years ago! Offices are characterized by rows of computers, printers, servers, telephones, headphones, lamps, TVs, virtual whiteboards—basically, a ton of electronic appliances. Then there’s the lighting. The heating. The cooling. It takes a lot of energy to run an office! Start conserving energy by turning off appliances that aren’t in use. Make sure the computers are on their most energy efficient settings. Turn off the lights when you leave. And definitely—definitely—switch over to energy efficient light bulbs! Don’t forget to take advantage of the sunlight as much as possible! Many office supplies, such as pens, paper, staplers, and paper clips, are now available in post-consumer content alternatives. Implement these alternatives! If no such eco-friendly substitute product exists, consider cutting down or altogether eliminating these products. Use recycled, post-consumer paper (only where necessary!) and cut down on printing wherever possible. Rid your office’s communal eating area of plastic and styrofoam products as much as possible. Encourage your employees to bring their own coffee mugs, instead of single-use options. Use biodegradable coffee filters, and prioritize local, organic, or vegetarian options wherever applicable. The change will speak for itself! Encourage your staff to explore alternate, more eco-friendly ways of communicating. Offer special incentives for carpooling, biking, public transit, and walking, and reduce your staff’s collective carbon footprint. How about offering your employees the option to work remotely? Many people love the flexibility and the luxury of starting work from bed! Have a large recycling bin on prominent display somewhere in your office’s business space. Encourage employees to use them. A ton of garbage is actually recyclable! Everyone knows the 3 Rs – reduce, reuse, and recycle— but many are now using a fourth R: refuse! When you next use an object, seriously consider if you really need it. If not, leave it be and find an alternate…you won’t need to bother with coming up with a way to re-purpose it. To keep your office clean and tidy, while also doing your part for the environment, switch to non-toxic, green products. With so many excellent and affordable products on the market, making the switch has never been easier!